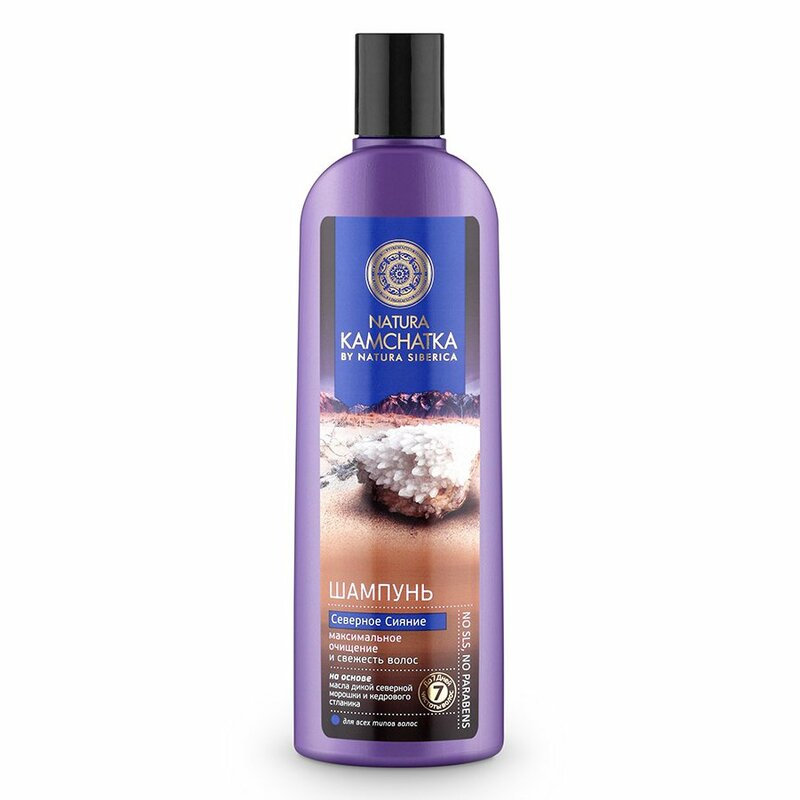 Northern Lights Shampoo is produced by the Russian beauty brand Natura Siberica for its Natura Kamchatka series. It is designed to thoroughly cleanse the hair and keep it fresh and clean for a long time. The product is formulated with wild northern cloudberry oil and Siberian dwarf pine extract. Its ultra light formula is free of SLS, SLES, silicones and parabens. It does not weigh your hair down. The shampoo is suitable for all hair types. It is enriched with herbal extracts and oils for a better effect. The product helps to restore the pH balance of your scalp and keep your hair fresh and light up to 7 days. Northern cloudberry seed oil contained in the shampoo provides your hair and scalp with biologically active substances. It moisturises the hair and protects it from harmful environmental factors. Cloudberry regulates sebum secretion and helps to keep your hair clean and fresh. Siberian dwarf pine strengthens hair follicles, repairs the hair structure along its entire length, gives your hair brilliant shine. Directions. Apply onto wet hair, lather, rinse with water. Repeat if necessary. Ingredients. Aqua, Sodium Cocoyl Isethionate, Lauryl Glucoside, Cocamidopropyl Betaine, Pineamidopropyl Betaine PS, Hippophae Rhamnoidesamidopropyl Betaine HR, Guar Hydroxypropyltrimonium Chloride, Rubus Chamaemorus Seed Oil, Pinus Pumila Needle Extract WH, Achillea Asiatica Extract WH, Agrostis Sibirica Extract WH, Juniperus Sibirica Needle Extract WH, Mentha Piperita Leaf Water*, Sodium Chloride, Benzyl Alcohol, Benzoic Acid, Sorbic Acid, Citric Acid, Parfum, CI 42090, CI 19140. Want to buy Northern Lights Shampoo? Call us or submit your order via our web site! Natura Kamchatka is a cosmetic series produced by the well-known Russian cosmetic company Natura Siberica. It is one of the company’s youngest brands. The Natura Kamchatka series was launched in September 2015. However, it already enjoys great popularity and high demand among consumers in Russia and its neighbouring countries. Cosmetic products branded as Natura Kamchatka are made with high-quality natural plant ingredients harvested in Kamchatka. Specialists of the company combine time-tested recipes and the latest technologies to create safe and effective beauty products. Natura Kamchatka’s quality and safety are confirmed by trustworthy international certificates such as ICEA, ECOCERT, COSMOS STANDARD, BDIH. It is worth noting that Natura Siberica plans to actively develop its second organic farm located on the Kamchatka Peninsula (the first farm opened in 2013 in Khakassia). The company’s Kamchatka organic farm has an area of 9.2 hectares, it is located near the city of Petropavlovsk-Kamchatsky. Natura Siberica purchased the farm in December 2015 to grow even more valuable Kamchatka plants which are used to make Natura Kamchatka shampoos, hair conditioners, body, foot and hand creams, body scrubs and other products.